John, Mike and I did one of our ‘grand days out’ and visited the Fred Baier exhibition at the Crafts Study Centre, Farnham. It’s good to get out and have our eyes opened, to see a world outside our own dusty haze, just occasionally. This is now the 3rd contemporary furniture maker that has been exhibited recently at CSC, the previous ones being John Makepeace and David Colwell. Although all from the same generation of pioneering British designer-makers their work is very different. I know Fred and his furniture least well of the 3, although I did have the pleasure of being at a talk of his when I taught furniture design at Uni – quite brilliant to listen to if you ever get the opportunity. So I was eager to see the work in the flesh. The CSC gallery is not big and the first impression as I walked through the door was a colour riot, it was like walking into some mad professors lab who’s idea of a good day at work is a bit of nuclear physics combined with experimentation with LSD while also trying to make a chair to sit on. The result is Fred Baier’s furniture. Actually that sounds flippant which is unfair and does not reflect the other side of his character, because everything is exquisitly made, perfectly finished and thoroughly considered. That riot of colour and form is well orchestrated. There is a lot of talk about where science meets art at the moment – the Big Picture here on the Dorset Jurassic Coast is just one example, it’s all very uber fashionable, but Fred Baier was playing around inventing ‘solid modelling’ CAD systems before they were commercially available. His work still reflects that geometric playfulness, he just did decades before anyone else and while I was still in nappies. I think Fred is just getting the recognition he deserves now: John Makepeace is generally and rightly regarded as the granddaddy of British Contemporary Furniture, perhaps Fred Baier is the fun great uncle. 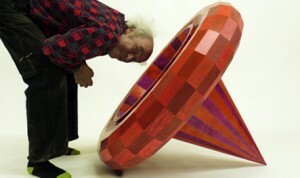 He is also an antidote to the obsessive and over ernest woodiness that can dominate the designer-maker scene today. The Crafts Study Centre website is also a must see.